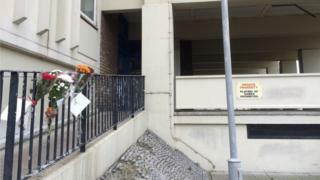 A man has been charged with the murder of a pregnant woman who died in a fire in a tower block. Khabi Abrey, 30, was one of seven people taken to hospital after the fire on the ninth floor of the Balmoral Road flats in Westcliff-on-Sea on Saturday. Lillo Troisi, 47, of Balmoral Road, has been charged with murder and two counts of arson. Mr Troisi, who is unemployed, is due before Southend Magistrates' Court later. The other two charges in full are arson with intent to endanger life and arson being reckless as to whether life was endangered. Ms Abrey and her unborn baby died in hospital on Monday night. A post mortem examination gave the cause of death as complications arising following breathing in fumes. Her unborn baby died of cardiac arrest due to Mrs Abrey's inhalation of fire fumes. Essex Police are continuing to appeal for anyone who had any more information about the fire.